Halloween is all about thrills and chills. Everyone have fun and enjoy themselves, but from tricks to treats, Halloween can present dangers to your pet. This spookiest night of the year, keep your pet safe, happy and healthy by taking these simple precautions. You can carry some special treats with you for your pooch and ensure that you don’t feed your pet Halloween candy, especially, if it contains chocolate or xylitol (a common sugar substitute found in sugar-free candies and gum). If you are dressing your pet for Halloween night, make sure that the costume is easy and light to carry for him, see to that it does not limit you pet’s movement, sight or ability to breathe. Check out the outfit carefully for small, dangling or chewed-off pieces that could present a choking hazard. Take time to get your pet accustomed to the costume before Halloween, and never leave your pet unsupervised while he/she is wearing a costume. Always make sure that your pet has proper identification. Ensuring your pet has a collar with his name and your contact information. You can even attach a microchip on his collar to increases the chances he will be returned to you, if you’re distracted with trick-or-treaters and he gets lost. If your are taking the pet along with you on the Halloween night, make sure that you have given your pet his monthly preventatives to keep him safe from flea and ticks. There will be many other animals, where your pet can easily get the parasitic infestation. Ensure that you have protected your pet from the various parasites and worms. BudgetPetWorld has announced hair raising discounts on pet care supplies on this Halloween. This sale is to help all the pet owners to get branded pet products, so that they can take along their pet on Halloween night without any worries of getting infestation of pests. 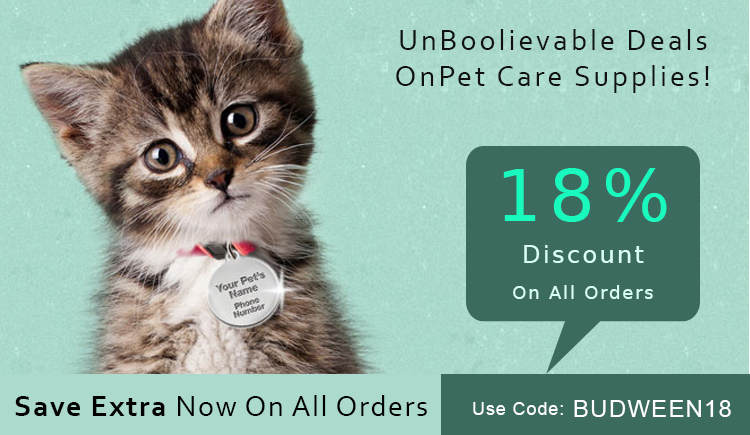 BudgetPetWorld is the dominant online store to get the best discounts on branded pet care supplies. We have wide range of products such as flea and tick preventives, dewormers, joint care, wound care, oral health care, eye and ear care, supplements and many more. HURRY!!! Stock up your rack with most popular brands of pet care products on huge discount of 18% this Halloween by using Coupon Code : BUDWEEN18 and with free shipping. Don’t miss this sale to have fun and keep you furry pal safe on the scariest night of the year.